This is the official start to my salad season. 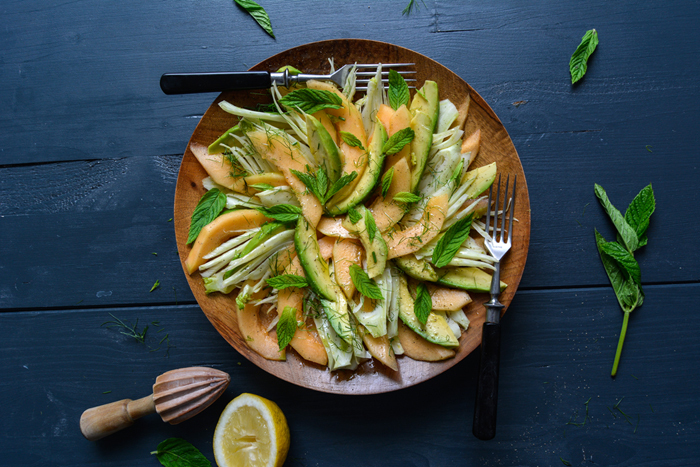 In the next month, I’ll be indulging – daily – in simple yet scrumptious compositions of tasty vegetables and juice-dripping fruits. Chopped and tossed with a quick vinaigrette or just a dash of olive oil and some flaky sea salt from Gozo. 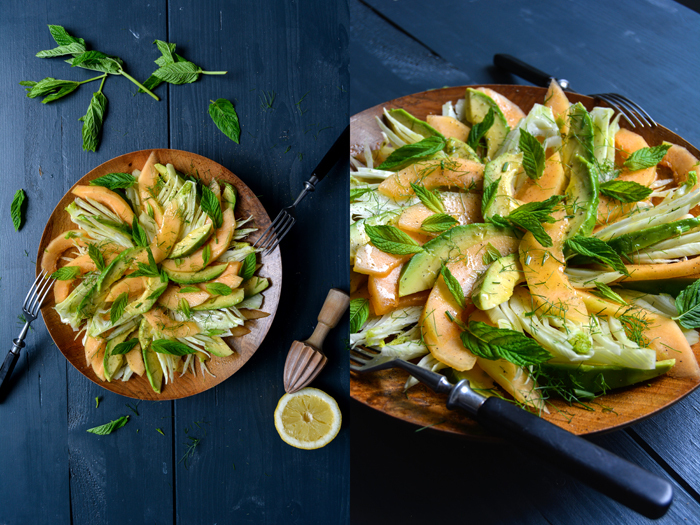 Ripe tomatoes, cucumber, fennel, radicchio, carrots and peas, the sweetest peaches, pears, and plums – summertime offers a firework of flavours and I’m ready to celebrate each single one of them. My next few weeks will bring the kind of temperature into my life that makes you think twice if it’s really necessary to switch on the gas cooker. We’ll be off to Malta soon and that means it will be 30°C (90°F) in the early morning and more than 40°C (105°F) at noon – this calls for a different menu. It’ll be hot, but I won’t complain, it’s the time of the year that I look forward to the most. I can run around in an airy dress all day and late night swims won’t leave me chilled – it’s warm enough to sit on the rocks with wet hair when the sun has already sunk into the sea. I can basically live outside 24 hours a day, that’s my kind of paradise. 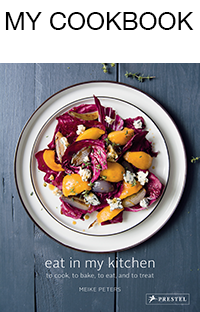 In the Mediterranean, you have to go with the flow and stay flexible, so we keep the cooking plan as open as possible to adjust to our mood. You can always find a large jar of fresh, homemade basil pesto in the fridge and, of course, the whole variety of Malta’s crop fresh from my favourite farmer Leli’s fields, all piled up on the table and shelves. Fresh oregano, marjoram, basil, and the spiciest arugula are ready to be picked in the garden and always at hand to refine a chunk of creamy mozzarella di bufala, a crunchy bruschetta from the BBQ, or a 5-ingredient pasta dish: Give me spaghetti, olive oil, salt, pepper, and fresh herbs and I’m happy. If I’m lucky, there will still be a few lemons on the tree in the family garden in Msida. The season’s over but my Maltese mama always keeps a few fruits on the tree for me, she knows how much a German girl enjoys the treat of picking the lemon for her morning tea straight from the branch. I decided that I’ll spoil myself with a kind of luxury that doesn’t cost anything: To slow down and keep it simple, to let go of constant planning and rigid expectations. I know that I’ll sit at the sea for hours, quite possible every day, but that’s as far as my schedule goes. We’ll be away for a month to stay with our Mediterranean family, we won’t stop working, but we’ll definitely take a great chunk of time off, it will be a different pace. To give myself enough time for the transition from my northern to my southern rhythm, I’ll prepare a few recipes here in Berlin to share with you in the first two weeks of my holiday. Once I get into the groove, I’ll write about my Maltese kitchen life. 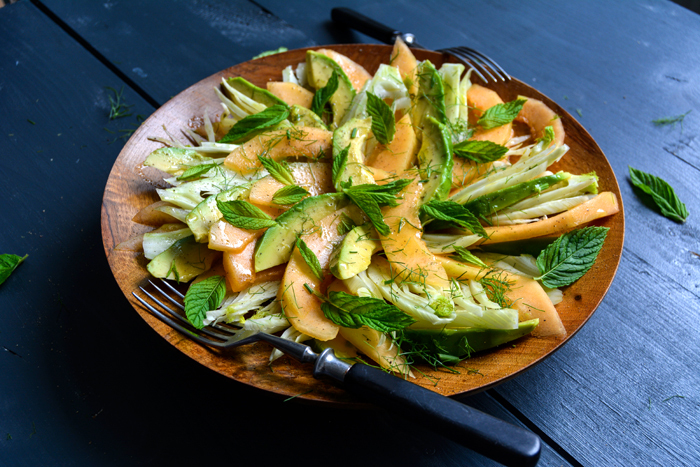 Until then, I will enjoy a foretaste of what my taste buds have to expect: a simple salad of velvety avocado, honey-sweet Cantaloupe melon, and crispy fennel – topped with fresh mint and a light vinaigrette. 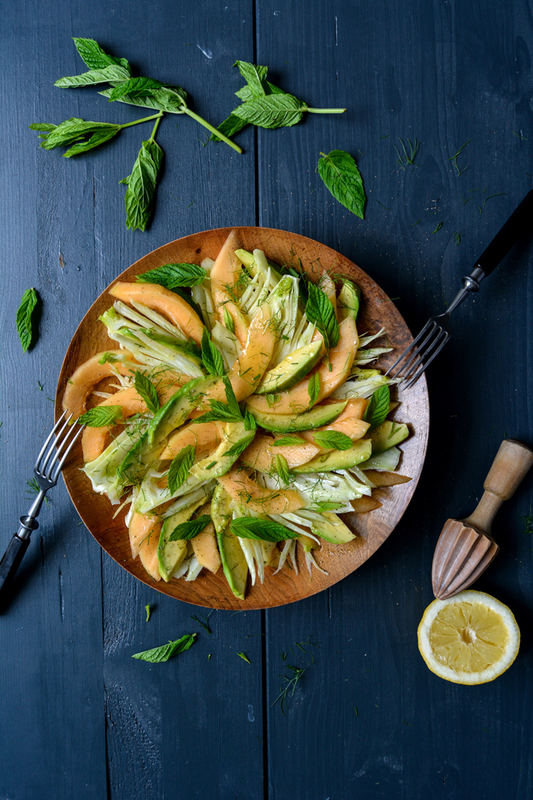 For the dressing, whisk the olive oil, vinegar, and lemon juice and season with salt and pepper to taste. 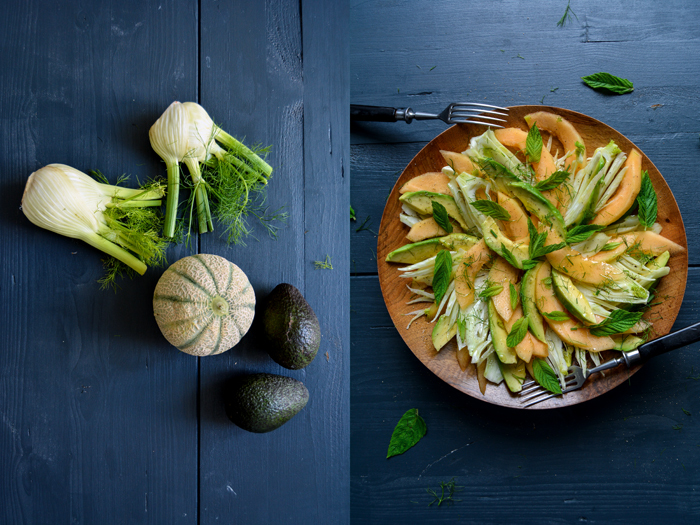 Arrange the avocado, fennel, and melon in layers in a wide bowl. 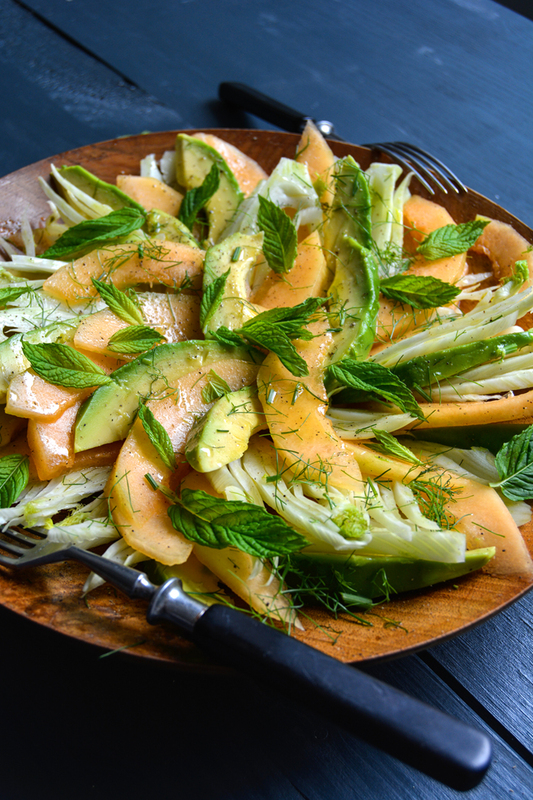 Drizzle with the dressing and sprinkle with mint leaves and serve immediately.